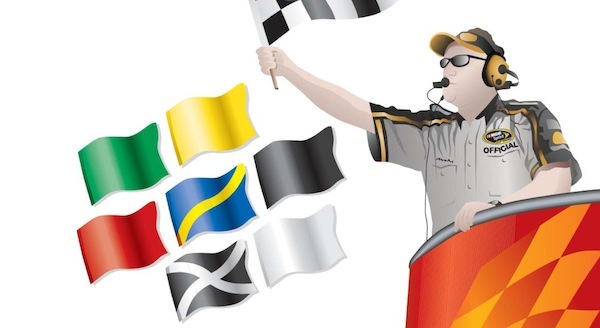 DAYTONA BEACH, Fla. (Feb. 11, 2010) – The National Association for Stock Car Auto Racing (NASCAR) today announced a revision to one of its race procedures, allowing a maximum of three restart attempts prior to the White Flag under NASCAR’s Green-White-Checkered flag finish. If the leader has taken the White Flag and the caution flag is displayed, the field is frozen and the race will not be restarted. Previously, there was only one restart attempt. The new procedure will be implemented beginning with today’s running of the NASCAR Sprint Cup Series’ Gatorade Duel at Daytona and will apply to all three national series. NASCAR officials met with drivers and teams Wednesday at Daytona International Speedway to discuss the change and get their input. The announcement was made during the NASCAR Sprint Cup Series’ drivers and crew chiefs meeting Thursday morning. The change amends procedure 9-14C of the 2010 NASCAR rulebook.